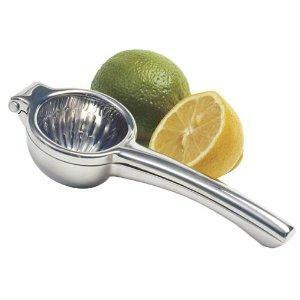 Stainless steel citrus juice press is one way to juice lemons. If you are experimenting with fresh juices, you may be interested in learning how to make lemonade with lemon juice and a blend of other fruit. Or,perhaps you'd rather make it the old-fashioned way with sugar. Both are refreshing, but lemonade made with fresh fruits as the sweetener is a healthy alternative to sugary drinks. The juice of lemons is used in a variety of ways from seasoning seafood, to adding a nice citrus zing to our drinking water. After you've juiced the lemon, the peel can be ground in your garbage disposal to freshen it with natural deodorizing qualities. Historically, women have used it to lighten freckles and bring out highlights in their hair. Whether you use it as a garnish, skin care product, seasoning, or as a medicinal aid, probably the most well-known use is in making the sweet, refreshing beverage known as lemonade. For such a little fruit, lemons pack a powerful amount of flavor, and a little juice goes a long way. How you juice your lemons will also make a difference in the taste of the lemon juice. For instance, if you cut a lemon in half and juice it with a standard hand citrus juicer or citrus press, your juice will be tart but not as potent as juice processed with a juicer that juices the lemon peel and all. This will make a difference in the amount of sweetener and water needed when making a lemonade recipe. The following recipes will show you how to make lemonade with lemon juice. The first is made without sugar and is a favorite among juicing recipes suitable for vegetarians or vegans on a raw food diet. The second is a traditional recipe for old fashioned lemonade sweetened with refined sugar. Both taste great, but the first is full of all things good. Add water to dilute to desired consistency and taste. DirectionsTo make apple lemonade you will need a masticating or centrifugal juicer which grinds the lemon, peel and all, and extracts the juice. These types of juicers take quartered apples, seeds, peel and all and deliver a pure, sweet apple juice. The type of apple you use for the recipe will make a difference in the sweetness of you lemonade. Granny Smith apples are tarter than most other apples. They complement the lemon's flavor and add the right touch of sweetness for most pallets. If this lemonade is too sour for you, try a different kind of apple for your sweetening agent. Makes approximately 2 quarts. Chill and serve over ice. Juice approximately 6 lemons to make 1 cup of juice. If you use a hand juicer or press to juice lemons, you can make the juicing process a little easier if you roll the lemons back and forth with your palm on the countertop while applying a little pressure. Then cut lemons in half and juice. Mix all ingredients in a gallon pitcher. Add the last 2 cups of water a little at a time until your lemonade reaches the tart but sweet taste that's right for you. Chill and serve over ice. If you don't have time to make lemonade, add lemon juice to your drinking water for a refreshing beverage with all the benefits of lemon juice.